Glas Maol is a complex shape with a broad flat summit at the junction of four ridges. The NW ridge with its top, Meall Odhar, is the normal access route, which is littered with ski tows. The SW ridge leads to another Munro, Creag Leacach, with a dry-stone wall leading most of the way from one summit to the other. The broad N ridge branches, with a NE branch connecting to Cairn of Claise and a NW branch, which has a path leading to Sron na Gaoithe, giving an alternative route of ascent. The SE ridge leads to Little Glas Maol, then branches with paths on the both branches leading to Glen Isla. The access route from the NW give the easiest access. 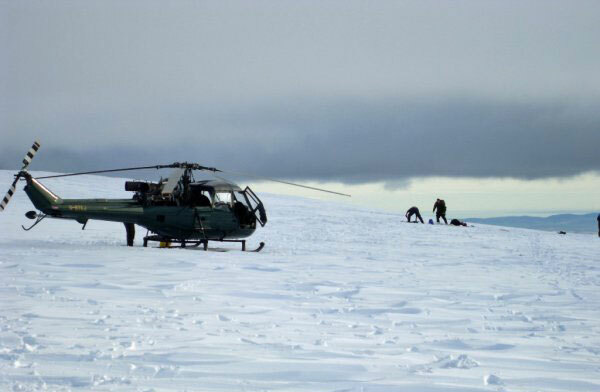 Helicopter on top of Glas Maol, recovering pieces of crashed microlight aircraft. Massive Glas Maol dwarfs the Glen Shee ski area (bottom right) as seen from the Carn Aosda/Cairnwell ridge. Glas Maol from the summit of Creag Leacach. 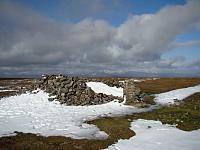 The cairn at the top of Glas Maol,on the 5/10/08,the wind had calmed down,and it was a cold but sunny day. 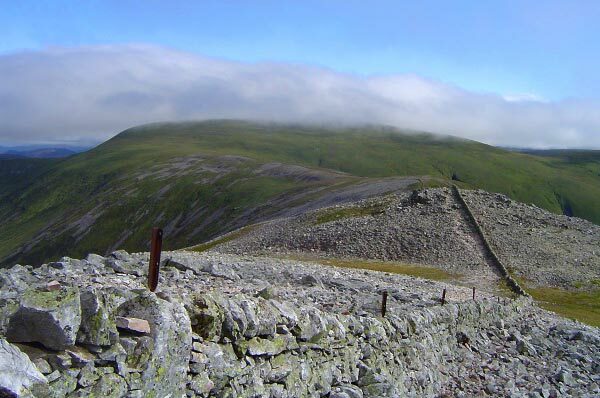 The summary information of one or more ascent routes that include Glas Maol. 1 562 m 11.58 km 3.5 hrs Glas Maol and Creag Leacach A short route on easy terrain There steep crags west of Glas Maol and Craig Leacach has steep stoney slopes. 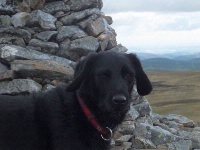 The Wee Black Dug, close up & personal, on Glas Maol. September 2013. 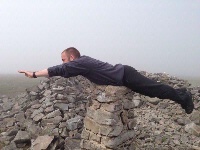 Post a few words about Glas Maol or read what others have had to say. Parked at Devils Elbow car park and dropped down in to Grouse Butts and crossed the burn.Obvious path up on to the ridge which sweeps up NW to the Ski Tows and Meall Odhar. via a bulldozed track.There is a Cairn here.Crossed flat ground then on to the nose of Glas Maol.Steeply up for 200ft or so takes you on to the flat summit with a large Cairn and Trig pillar ahead.The next Munro.Creag Leacach is well seen from here. I climbed Glas Maol & Creag Leacach with my wife Jackie and 2 Collies Ollie & Tino on the 31st May 2009. The weather was amazing with spectacular views for miles all around. Please be aware that there are birds nesting at or near the summit of Glas Maol, extra care is needed to avoid stepping on them and dogs should be kept under close control between April and August to save disturbing the ground nests. Did this a little differently, parked at Auchavan, and walked down Glen Isla to the Monega Hill Pass, then up to the summit of this hill with fabulous views of Caenlochan Glen. Then over Little Glas Maol to the summits of Glas Maol and Creag Leacath, back by descending into Glen Brighty. Much more interesting than the norm. To avoid the hideous ski lifts till the last moment try parking at the car park (139,757). Ascend the north slope of Meall Gorm then proceed on to Creag Leacach from here. It's then an easy walk over grassy slopes to Glas Maol, sometimes with huge herds of red deer to be seen along the way. An easy descent via Meall Ohdar takes you past the ski tows until a path veers off southwards via Leacan Dubh for most of the way to the car park. This is maybe not one of the most inspiring routes but at last light with the deer herds it can become a more peaceful and rewarding walk. 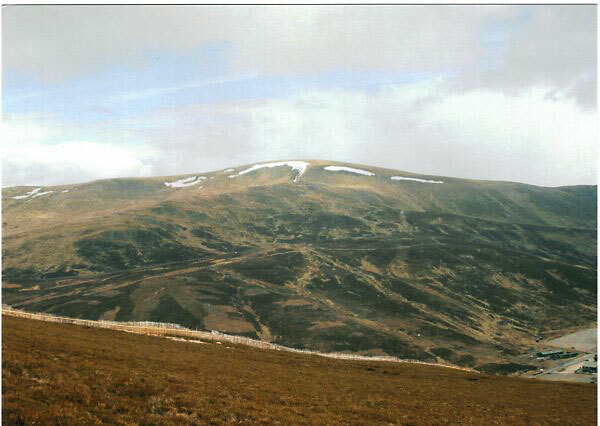 An alternative is to go to Creag Leacach first by contouring the west slopes of Glas Maol. A good path branches to the right (south) between Meall Odhar and Glas Maol. The south slopes of Glas Maol are also slightly easier. This is a good half day's walk, Creag Leacach is arguably the most shapely of the Glenshee Munros, with the bulky Glas Maol the highest point in Angus. Meall Odhar on the other hand is a hideous slog past rusting ski junk - it's only redeeming feature are the bulldozed tracks which enable quick passage.